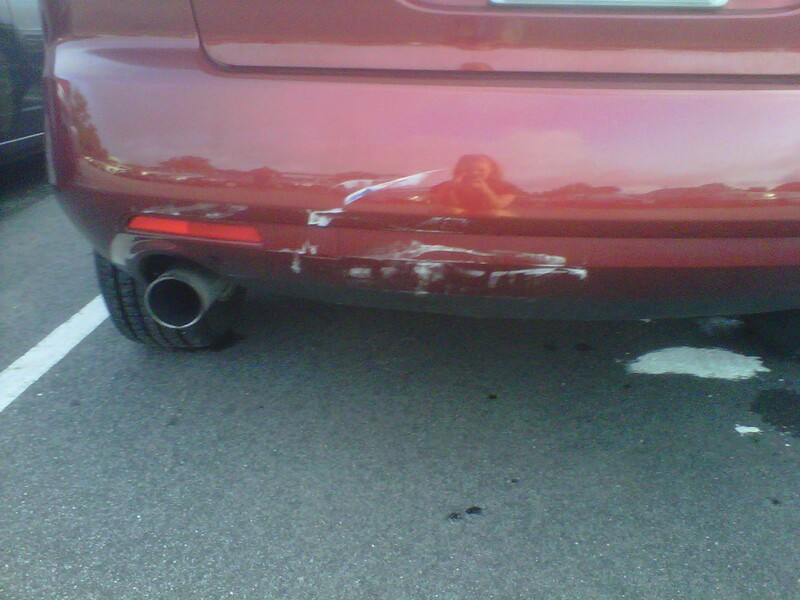 My car has an injury :*( | If Not Now, When? I was on my way to work today after stopping at Starbucks for the obligatory “it’s friday so that means Venti Skinny Vanilla Latte for Terri and a Grande Hot Chocolate for Chief’ start to the day. We’ve been doing this every friday for several months now. Since I get her hot chocolate, she gets my breakfast at a random point during the week. Good stuff for everyone. Except this morning. When I got into an accident. I’m fine (well, my back is starting to really ache but I don’t know if it’s because of my accident or because I didn’t sleep well…again…last night). I was driving on one of the interstates that lead to work when all of a sudden everyone slams on their brakes – this is common where I live. Any reason for the slamming on the breaks is acceptable – gush of wind, squirrel, rainbow, threat of thunderstorms – but slamming on the breaks is necessary. So I slammed on mine to avoid hitting the car in front of me. I didn’t hit them but the woman behind me hit me. So I’m dealing the fun that is the insurance companies – and who pays what when and for how much. I’m thankful that the woman that hit me HAS insurance and she stopped and that I wasn’t cited for anything. I have the proof that the State Trooper cited her for following too closely. I’ve notified family, friends, employers, insurance companies and EMS. I have documentation of conversations and claim numbers, claim representatives and email exchanges. I’m armed and ready to make the insurance company pay for my car boo-boo repair. It's a boo-boo...and look, you can kinda see me in the background! But my back is really sore…and I don’t want to go to the doctor to tell me to take some Motrin and do some stretches. Ah – the infamous stubborn streak – it shows it’s ugly face once again!